Chelsea are closing in on a deal to bring Gonzalo Higuain to the club for the remainder of the season. Maurizio Sarri is desperate for options up front, which was only reinforced by Chelsea’s 1-0 Carabao Cup semi-final defeat by Tottenham on Tuesday night. And it appears that a reunion with the Argentine striker he managed at Napoli is on the cards at Stamford Bridge. The 31-year-old has accepted an offer to join on loan and the move could be completed in the next few hours, according to reports in Spain. 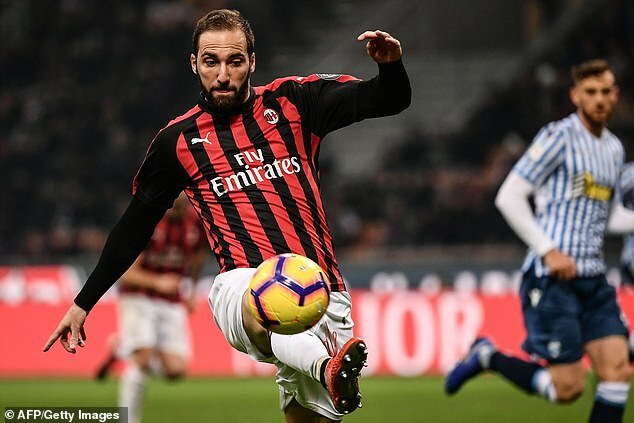 AC Milan are willing to let Higuain end his loan spell from Juventus after only eight months, according to Marca. He has scored only eight times in 20 appearances for the Rossoneri. Higuain played under Sarri at Napoli in 2015-16, and enjoyed the most productive season of his career with 38 goals in 42 games. His arrival would likely signal the departure of Alvaro Morata, with Sevilla keen on bringing the misfiring striker back to Spain.